There were beads of perspiration on her forehead; she felt nervous and then there was a searing pain in her lower abdomen. Deft hands worked fast and after what seemed like an eternity, she heard the cry, shrill, loud and yet pleasing, long awaited. Her son had been born!! The greatest bliss that a mother encounters in her life span is undoubtedly the moment she fondles her child post delivery. Imagine the momentous plight she goes through when the same cherished child scorns at her, yells or even abuses her. Behavior that turns violent and dominating and compels the parent to cringe is unanimously termed as disrespectful behavior and if a child or teenager manifests such rudeness, it is a testimony to a glaring problem embedded somewhere and that has been so long overlooked. What makes the tyrant shout, abuse, and hurl things? Seeking Attention: Many kids harbor the idea that it’s only when they shout or back chat, they gain importance. Thus simply to relish the reaction of shock or laughter, they misbehave. Foul behavior in the family: Children speedily imitate whatever they observe. 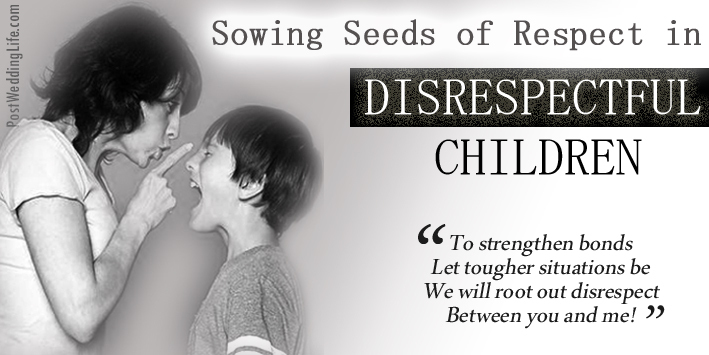 Arguing parents unknowingly implant seeds of disrespect into the naive minds of their kids. The fast changing society: The tempting options of social networking sites, tv promotes long lasting stress. The child fails to cope up, feels frustrated and the outburst surfaces as disrespect. Preoccupied Parents: The boom in nuclear families has literally crippled children. With no support system back at home, there are no value systems either. There is only the grumpy dad or hardly attentive mom to turn to. Avoid being over-protective: Parents who tend to indulge in every activity of their kid end up kindling germs of superiority, snobbishness in them. “When will you return Sam?’’ The over-confident son carelessly retorts, “You don’t need to bother.” Let the child be. Don’t meddle in his/her every affair. Be sure to involve positive statements: Respectful statements like, ‘’Say hello to driver uncle’’ or ‘’ There should be no arguments during meal times’’ enhance the child’s ability to grasp the full significance of being respectful. Appreciate good behavior: If the child has been respectful even to a passerby, try to glorify the incident. No Criticism: The child should never be corrected in front of others. There should only be a healthy explanation of the fault. As a child advances towards adulthood, their brain undergoes a massive transformation. Along with the sudden adrenaline rush of puberty, the brain prunes all that’s unimportant and retains only the needed ones. Most parents are unable to digest this and fall victim to pervasive-aggressive behavior or PA.
Be Calm: It’s normal for a mother to feel dejected when her adult son or daughter misbehaves. However, aggression only incurs negativity. Hence, take out time for a composed discussion with your ward. Give ample space: The child has matured and has his/her values and ethics. Consequently, let the gentleman or lady sort out his/her definite ways. Mistakes may occur but let them be the stepping stones towards success. Set clear timelines and expectations: When misbehavior persists, it’s essential to draw the line that defines proper behavior. Little Shiela had hardly got over the unbearable grief of losing her mother that her dear daddy brought home a monstrous witch, a stepmother. Sheila did everything she could to make new mom’s life miserable. She spilled milk and put the blame on mommy, she lied, argued rudely and even attempted to strike her! Indeed, step children can be troublesome, unresponsive but a new mother too needs to sink in the inherent truth that the absence of a real mom/dad can hardly be replaced. To embrace a new member as a family requires mammoth time for changes are hard to accept. Give space to your step kid: Don’t meddle in every minute detail of the kid. Keep your identities separate. The child would gradually feel the urge to form a bond with you. Set clear rules and enforce them: “You don’t need to shout always. Being patient doesn’t mean that I am not hurt. Be gentle and I would always be there.” Such firm guidelines would naturally make the child ponder and take precautions later. Kids usually cover up their apparent rudeness with comments as,’This was a joke’. However, parents should be firm in declaring that such behavior is not right at all and would mean a reduction in playing time or seeing tv if such jokes persist. The saying goes ‘spare the rod and spoil the child’; indeed, a study reveals crudely how 68% of American parents insist upon spanking their kids for their own good,90% spank their toddlers at least three times a week! They are essentially scary of an unimaginably rowdy, forbidding behavior their precious child may adopt if not corrected early for every single fault. However, it’s never too late to mend and let’s not make the child a scapegoat of our far-fetched ambitions. Adam and Eve disobeyed God and their eating of the forbidden fruit, being an act of disrespect severed the natural bond between God and man. Our bond with our children should never perish, and if disrespect forms the issue, care has to be taken to cease it.